…so in this article I’m going to review a couple of them to find, what I consider to be, the best gig bags for trumpet. …it would, for example, be pretty unnecessary ordering a trumpet case for three trumpets if you only have one. The Protec IPAC is a very good trumpet gig bag. In fact it’s one of the best cases for trumpets you can find. It’s protective and nice looking and in addition to that it also comes with a pretty decent storage pocket. Sure, you won’t be able to fit all your music in there but it is good enough. The adjustable foam blocks make sure you can fit smaller trumpets in it as well. Not just your Bb trumpet. At the time of writing this article, and testing the cases out, the price for this gig bag was under 200 bucks. You can click here to check current pricing on Amazon. Q: Will it fit all Bb-trumpets? 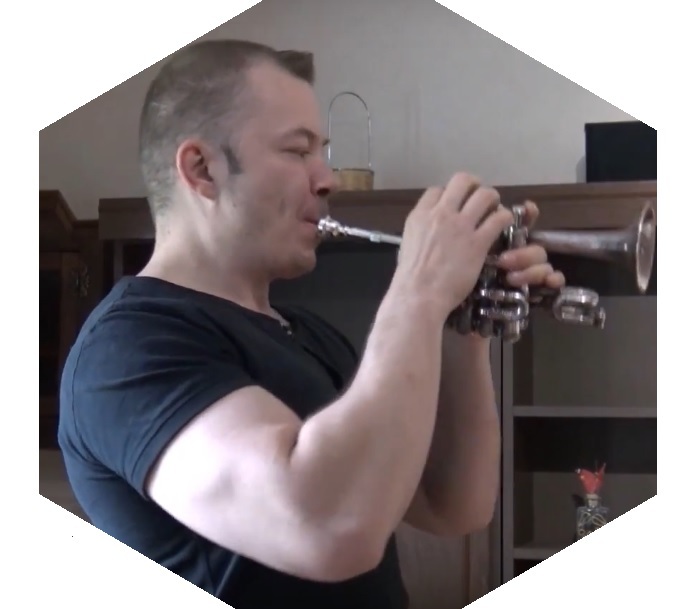 Q: Can I use it for smaller trumpets like my C-trumpet? Q: Is there a special place for mouthpieces inside this case? Some flugelhorns may be too big /deep for this trumpet case if it’s fully loaded with four horns. This is a good quality trumpet gig bag for the trumpeter owning several different horns. The case can hold up to four trumpets. The trumpet case is surprisingly light yet, with its shock absorbing wooden frame, it’s still protective and you can feel secure about carrying your expensive trumpets around in this gig bag. The zipper and the straps are very well built and radiates quality and I’m confident they will hold the test of time. The straps are strong and will securely hold the case when fully loaded. I don’t have any problems at all with the pricing of this trumpet case. For the quality you get and the case with room for four trumpets, I think it is a reasonable price. At the time of writing this article the price for this gig bag was just over 200 bucks. You can click here to check current pricing on Amazon. Q: I’m interested in this gig bag but I would only use three trumpets. Would this make them be to loose inside the case? A: Not at all, It just means you get some additional storage space for whatever you might want to bring along to the gig. Q: I have a cornet and also a flugelhorn. Can the case handle them as well? A: Yes indeed unless your flugelhorn is an extra big one. The different pads that come with the case makes the case configurable and easy to make the horns you need fit tight and snugged. Q: What about the storage space for my sheet music? A: There is a big pocket that can hold a lot of music. A gig book with over 300 songs, no problem! 14x14cm Exterior Pocket for mouthpieces, sheet music, straps etc. This one is sweet and well worthy as a candidate in the “best gig bags for trumpet”, article. If I was in the market for single horn trumpet gig bag I think I would go for this one. It feels light yet it does a good job at protecting the trumpet. First impression when holding it = quality! It is certainly not a hard case, but definitely does a good job at protecting the trumpet and it is a dependable transport bag. If you want a good trumpet gig bag that carries only one trumpet you can’t go wrong with this one. click here to check the exact pricing on Amazon. A: Yes you can, you will have no problems with that. Plenty of room for accessories like mutes, valve oil etc. This is my personal favorite and I will buy this one for myself, since my old gig bag that I got 15 years from now, (another brand) is starting to give up on me. The case easily fits three trumpets or one flugelhorn and two trumpets. I will use it fro my Bb-trumpet, my Eb-trumpet and my Getzen piccolo trumpet. It’s very protective, nice looking and it feels great to carry over the shoulder. I think this is the best trumpet gig bag you can find for under 200 bucks. At the time of writing this article it was around $150, you can click here to check the current pricing at Amazon. Q: Can it carry a flugelhorn and two trumpets? If you are looking for a good trumpet case, and you don’t like the softer ones, then this trumpet gig bag might be just what you need. As one of the best cases for trumpet it really is very protective and it comes with a pretty big storage pocket on the outside. Since it is a harder case and more protective than the Xinlinke it is a bit heavier as well but it’s still very comfortable to carry on your shoulder. The pricing for the gator single trumpet case is a bit higher than for the Xinlinke but it is still well under 100 bucks. You can click here to check the exact pricing on Amazon. Q: Can I use this for my C trumpet as well? Q: Can I use it for smaller trumpets like my Eb-trumpet? If you want a protective and practical trumpet case with room for your accessories then this is for sure the one you should choose. It can hold several mutes along with other stuff you want to bring to your gigs or rehearsals. Q: Is this case strong enough to be checked in as luggage in the airport? Q: I use three different mutes and I also have a tuner…room for all? A: Should be no problem! Q: Can I use it for my C-trumpet? Lightweight telescoping handle adjusts to 2 heights with custom designed smooth rolling in-line skate wheels for optimum control and maneuverability. This is a very nice and professional trumpet gig bag. If you travel a lot and do gigs then this is the right choice for you since it’s easy to move with the wheels and the lightweight telescoping handle. This triple gig bags is only about 200 dollars, you can click here to check the exact price on Amazon, which again surprises me a bit. But hey, I’m not complaining, the case is well worth the money! Q: Will it fit all kinds of trumpets? Q: Is there room for mutes if I put all my three trumpets in the case? Q: Is there a motor for the wheels? A: Come on…really? No comments! So there you have it, those are, what I consider to be, the best trumpet gig bags on the market right now. Sure, it is possible to find others but when talking about the quality to price ratio, I really consider these to be the best trumpet gig bags. I hope you found at least one of them interesting and worthy of taking a closer look at…. …if you want more storage room then buy a gig bag that is made to be able to carry one more trumpet than you aim to use. You have two trumpets and want a trumpet case with a lot of storage? …why not buy a gig bag for three trumpets? Previous Previous post: What’s The Hardest – Easiest Brass Instrument To Play ?